At Wests Juniors we have junior teams across all age groups from U10 – Opens (U18) and these teams play in the Sydney Junior Rugby competition, against teams from all over Sydney. 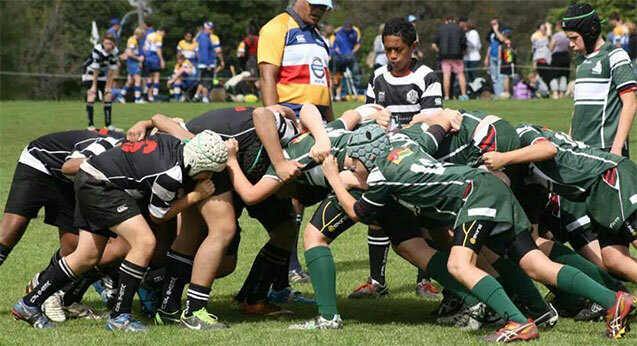 Junior rugby is an opportunity for players to start to experience the thrills of competition, with the level of competitiveness phasing in slowly from U10-U13 levels. Once players reach these age groups we are beginning to see the commencement of grading, with teams organised into grades within age groups to ensure they are participating at an appropriate level for their skill levels, to ensure maximum safety and player wellbeing. Our U10-U12 age groups, like the minis program, follow the Pathway requirements that have been developed to increase activity levels for maximum participation and enjoyment. The Pathway provides an integrated and consistent approach to the development of U6 to U12 players, coaches and referees nationally. At U10-U11 level teams progress to a 12-a-side and “modified full field format with 2 x 20 minute halves. At U12 level, teams play a 15-a-side full field format which prepares them for transition into U13’s. The U10-U12 age groups are open to both boys and girls. The Australian U19 Law Variations apply from U13 – Opens (U17 – U18) and follow on from the TryRugby Kid’s Pathway, continuing the progression of players rugby skills and development. In U13 – Opens age groups, junior representative opportunities exist at local club, school and regional levels. Through these diverse age ranges the priority is to provide the players with opportunities to learn. U10 – OPENS play on a Sunday in the Sydney Junior Rugby Competition against teams from across the Greater Sydney region. Our junior teams play other teams from across Sydney within their grade, typically on a home and away basis. Wests Juniors home ground for junior rugby is St Luke’s North, Crane Street, Concord.